Amaretto Poached Pears Recipe - Let the Baking Begin! Amaretto Poached Pears with Chocolate Shavings are Simple, Low Calorie, Gluten Free and super Easy to Make. The lightly sweetened poaching liquid is packed full of flavor from the liqueur, aromatics, and vanilla. Whether you make this poached pears recipe as a stand-alone dessert or as a part of another dessert, these are always popular at the table. Poaching is a way to cook something in a slow, simmering fashion in order to infuse it with the flavorful poaching liquid. You want to choose firm but ripe pears for this recipe to help the pears withstand the simmering. Bosc pears are typically the best for this poached pears recipe as they retain their firmness even when fully ripe. The Amaretto Poached Pears are every hostess’ dream. They can easily be prepared ahead and left in the fridge until that perfect time (up to 5 days). In fact, the longer they sit in the fridge, the more time the pears have to absorb the delicious flavors of Amaretto, cinnamon, vanilla, and the star anise. What goes with poached pears? The delicious, tender aromatic pears can be served as is in a cup with some poaching liquid, with chocolate shavings like shown in this post, with delicious chocolate sauce (like this chocolate ganache), a drizzle of caramel, creme Anglaise, or a some crushed up Amaretti cookies. 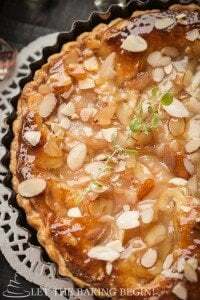 You can also make use these poached pears to make a delicious Almond Creme tart as I did HERE. In a large pot combine all ingredients but the pears. Stir & bring mixture to a boil over medium heat. While the mixture is coming to a boil, peel the pears leaving the stems on. If later using for a tart, you can split the pear in two and core it as well. Add the pears to the poaching liquid and simmer over low heat until the pears are soft and easily pierced with a knife. Do not overcook or the pears will become too soft. Depending on how ripe your pears are, anywhere from 10 minutes to 30 is enough.Leave the pears in the poaching liquid for a couple of hours, or better yet overnight. This will allow the pears to be completely infused with the flavors of vanilla and liqueur (p.s. the alcohol evaporates and the poaching liquid is simmering). When ready to serve, transfer the pears to a rimmed serving dish, pour a bit of poaching liquid over the pears. Sprinkled with chocolate curls. Microwave a chocolate bar for about 15 seconds, in 2-3 second intervals. You want the chocolate bar to become a little warmer than room temperature. This will make it easier for the chocolate curls to form without crumbling into shards.Now use a paper towel to get a better grip on the bar, next using a vegetable peeler (this one is my favorite, ‘been using it for years) run it along the rib of the bar producing beautiful chocolate curls. Do not discard the poaching liquid. Pour it over ice and drink it as a refreshing drink, diluting it with water until desired sweetness. Almond Cream and Plum Tart – Simple tart recipe with almond cream and plums. 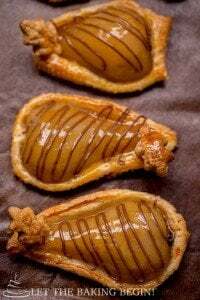 Poached Pears and Nutella Pastries – Puff pastries with poaches pears and Nutella. 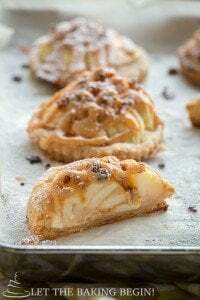 Apple and Dulce de Leche Pastries – Dulce de leche drenched apple treats. In a large pot combine 3 cups water, 1 cup sugar, 2-3 tablespoons lemon juice, 1 cup liqueur of choice, 5 tablespoons vanilla extract, 1 star anise (optional) and 1 cinnamon quill (optional). Bring mixture to a boil. While the mixture is coming to a boil, peel the pears leaving the stems on. If using for a tart, you can split the pear in two core it as well. Add the pears to the poaching liquid and simmer until the pears are soft and easily pierced with a knife. Do not overcook or the pears might be too soft. Depending on how ripe your pears are, anywhere from 10 minutes to 30 is enough. Leave the pears in the poaching liquid for a couple hours, or better yet overnight. This will allow the pears to be completely infused with the flavors of vanilla and liqueur (since the liqueur is brought to a boil and simmered, all of the alcohol will be evaporated). When ready to serve, transfer the pears to a rimmed serving dish, pour a little bit of poaching liquid over the pears. Sprinkled with chocolate curls. Microwave a chocolate bar for about 15 seconds, in 2-3 second intervals. You want the chocolate bar to become a little warmer than room temperature. This will make it easier for the chocolate curls to form without crumbling into shards. Now use a paper towel to get a better grip on the bar, next using a vegetable peeler run it along the rib of the bar producing beautiful chocolate curls. 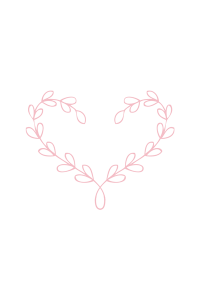 Hi, I tried making the tarte and it’s the best! Would like to make it again tomorrow for my husbands birthday, but need to make a pregnant proof version. What could I poach the pears in if not liquor? You can just omit the alcohol and it will be ok. The vanilla and sugar will be enough to flavor the pears. Making it this weekend!!!! it looks so delicious!!!! Hi, I plan on making tart. So I was wondering how do you store these pears in refrigerator and how long? Poached Pears and Nutella Pastries - Let the Baking Begin! Let the Baking Begin! Having Julia Child mentioned in this context is a great honor 🙂 Thank you Chels! 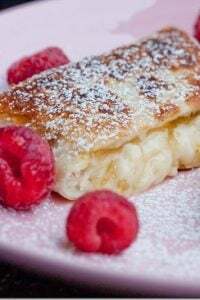 Gorgeous recipe and photos! I’ve never tried poached pears, something is telling me I am missing out! Thanks Julia! 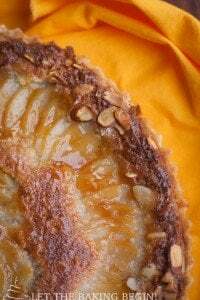 I am about to post couple other recipes where you can use these delicious pears. But I’m telling you, they’re so good on their own, you should definitely try them!